Michael Singer was commissioned by the Arts Council of Santa Barbara to design and build the central Courtyard Garden with sculptural elements for the Casa Nueva Santa Barbara County Office Building. The Courtyard Garden design centers around several sculptural gathering benches and water troughs that reveal the foundation footprint of a former building on the site. 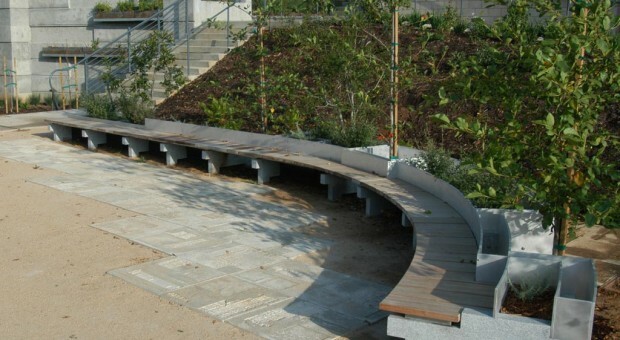 A large curving granite, aluminum and teak bench incorporates planters and water features with seating. A vegetated wall of layered mesh and cable screens are positioned in front of a patterned concrete retaining wall and enclose part of the courtyard. At the building’s entry a large cistern with sculpted seating caps is planted with grasses. Custom pavers with patterned textures create a continuous sculptural tapestry throughout the garden. This project was sponsored by the Santa Barbara County’s percent for art program.